The most moving film nominated for Best Foreign Picture was not the one that one. South Africa's Tsotsi bested France's Joyeux Noel, a movie that seems tailor made for Academy voters. It is a period piece set in World War I, is about the futility of war, and has a fantastic international cast. It also shows how human man can be amidst war in a manner different from other movies. Typically, directors show the evils of war by showing how horrific the violence can be. 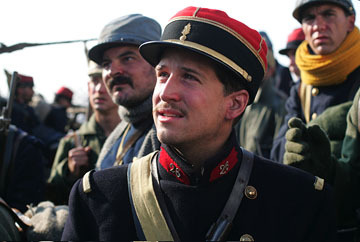 Writer/director Christian Carion (The Girl from Paris) based Joyeux Noel on actual events on December 24, 1914, when troops laid down their arms for a temporary ceasefire. Trench warfare is horrifically violent, and Carion begins with a restrained look at how costly these tactics were. In occupied France, the French and Scottish square off against the Germans in what basically amounts to a stalemate. They have been fighting for months, and are tired of death and want to be home. Carion focuses on a few soldiers from each side, telling the story of their countrymen through them. Scottish priest Palmer (Gary Lewis, Yes, Gangs of New York) convinces the military to let him serve with the locals from his parish. German tenor Nikolaus Sprink (Benno Furmann, The Order, The Princess and the Warrior) decides to leave a posh party with high-ranking military officials in order to return to the frontline to sing to his fellow troops. French Lt. Audebert (Guillaume Canet, Love Me If You Dare, The Car Keys) misses his pregnant wife, who is currently in occupied France. He has not been able to correspond with her for months. By focusing on the characters, Carion is able to give Joyeux Noel an extremely personal feeling. The people in the audience watching the film can intimately identify with the people on screen. On Christmas Eve during a lull in battle, Palmer, gathered with the Scots, begins playing a bagpipe. The sound seems so alien on a battlefield. Sprink responds by singing (sung by tenor Rolando Villazon), walks up into no man's land, and over to Palmer. The scene is beautiful and dangerous at the same time. Nothing happens, and soon, Horstmayer (Daniel Bruhl, Ladies in Lavender, The Edukators), the German officer in charge, meets with his counterparts and negotiates a ceasefire. The soldiers come out of their trenches to meet. It is extremely emotional. Earlier in the day, these men were shooting at each other. Now, they are celebrating mass, sharing drinks, and exchanging pictures. There is an especially moving scene with Sprink's girlfriend Anna Sorenson (Diane Kruger, National Treasure, Wicker Park), who delivers a beautiful solo (sung by Natalie Dessay). The experience of the night is both surreal and dreamlike, and profoundly changes all involved. No longer are they shooting at Germans, Scots, or the French, but now they are shooting with people they got to know. Carion, using his large cast, is able to show the effect on all three sides. All the men realize that war is not the answer, and that they have more in common than they originally thought. Because of this unique experience, nobody else, especially their superiors understand them. Carion moves slowly, allowing the audience to see the initial caution and wariness felt by all sides slowly transform into trust and friendship. So should it have won the Oscar? That's debatable. But what isn't is that it was definitely worth of a nomination. 1 hour, 56 minutes, French, German, and English with English subtitles, Not Rated but contains violence, probably a PG-13 or R.